Elvira Ciolli in center. Antonio Del Principe far right. In one of the interviews my brother Rob and I had with Auntie Phyllis in 2011, Auntie Phyllis talked about her grandmother Elvira’s siblings. I was not aware that her sister Gemma Nicolina Ciolli Leone lived right across the street (didn’t every family member live right across the street? 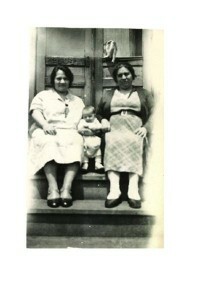 ), or that Gemma was Auntie’s godmother. Both mom and Auntie Phyllis were baptized at St. Callistus Church. Click here to see a birth record for Gemma (item #62). In the audio clip below Auntie also discusses what life was like during the depression. 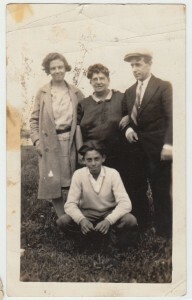 The photo to the left is Elvira and her son, Antonio, is standing next to her. I don’t know the other two people in the photo. The photo to the right may be Elvira and Gemma. If anyone recognizes these ladies, please email me and let me know. Gemma (1855-1952) married Giacomo Leone and they had 10 children; Esther, Carmen (Mimi), Phyllis (Fifi), Jeanette (Gerr), Christine, Anthony, Rocco, Joseph, Anne, and Josephine. 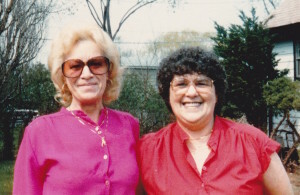 Carmen and Phyllis were twins. I am in touch with Rocco’s son, Giacomo. 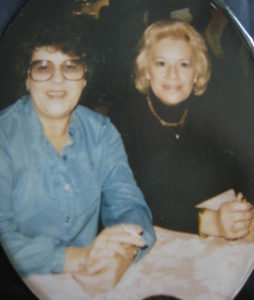 Giacomo emailed me and told me “Carmen and Phyllis were twins. There were perhaps two other children who died from Tuberculous. 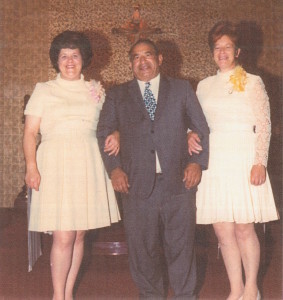 My parents were Rocco Mario Leone and Caroline Philomena Amici. My mother is a first cousin of Don and Jim Amici. Don was the more famous actor, his brother Jim was a local Chicago radio personality.” As a young adult Giacomo visited the family’s music store. You can read about Gemma’s brave journey from Pescasseroli, Italy at this blog post and see her 1901 immigration record. It appears that she traveled to America with no other family member in 1901 onboard the ship Patria. Click the audio link to below to hear Rob and I discuss Elvira’s sisters and the depression with Auntie Phyllis. This is our 3rd audio clip from our 2011 interview Auntie Phyllis. For more articles about Gemma click on her name in the Categories column to the right. Wow, I can’t believe how fast this year has flown by! My last blog post was in May. While I haven’t had much time for family history research I have had an amazing summer and fall. The highlight was my 60th birthday celebration. 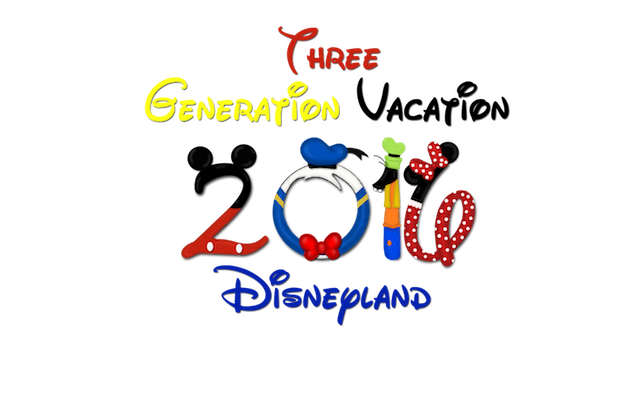 It just happened to be Disneyland’s 60th celebration also. 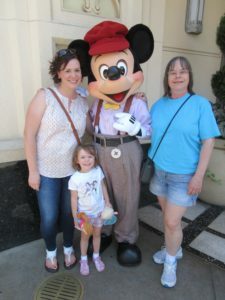 So Ashley, Abby and I went to Disneyland for one week and had a blast! Ashley did a wonderful job planning the whole trip. My only request was that we have breakfast with the princesses and Abby was pretty happy to oblige. Happy Holidays family and friends! I hope you all take time to enjoy the company of your loved ones during this festive season, share stories from the past, and create new traditions for the future. May 2017 bring you Peace, Love, and Happiness! For many years, in the late 1990’s, Auntie Phyllis lived with my mother Corinne and my sister Lori in Romeoville, Illinois. 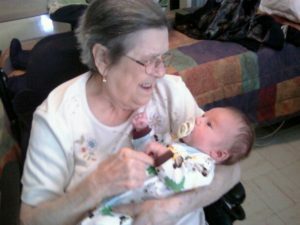 In the audio clip below Auntie Phyllis talks of her love for Chicago, joining the Red Cross during WWII and the birth of her first child, Mark. The photo on the left was taken a few years before Lori bought her home in Romeoville. The next paragraph is one of Lori’s favorite memories of that time. Click the link below to listen to part of the interview that Rob and I had with Auntie Phyllis in 2011. This is the 2nd audio clip. To listen to the other interviews, click on the box titled “Vincent Family” in the categories box to the right. 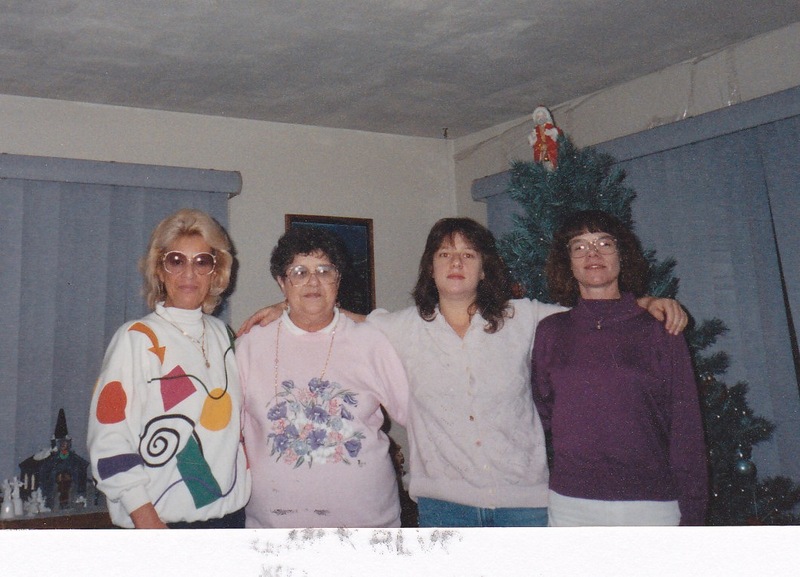 Thanks to my siblings for their memories of our Aunt. Lori lives in Utah now but comes to visit us in Portland frequently. Rob is a national leader and trainer for Recovery International. Click on this link to hear Rob discuss Mental Health Recovery. This weekend I edited more of the three interviews that my brother Rob and I recorded with Auntie Phyllis in 2011. Auntie was my mother Corinne’s older sister. You can listen to the first interview by clicking here. I’ve skipped ahead to our third interview but will be editing the other two interviews as time permits. In this discussion we asked auntie what has given her the most pleasure and satisfaction in her life. “My children”, she told us. Phyllis and Richard had five children; Mark, Toni, Ricky, Gina, and Michele. 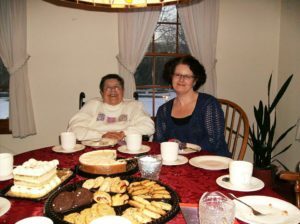 We also talked about my genealogy research and how pleased auntie was to begin correspondence with her first cousin, Joe Del Principe. Rob then moved the discussion to God, faith, miracles, and Heaven. Auntie Phyllis encourages her descendants (in 2011 she had 14 grandchildren and 14 great grandchildren) to follow their dreams. We ended with a story about how Auntie “calmly” explained to an aide in her assisted living center the difference between spaghetti and macaroni. Auntie’s daughter Michele shares a memory below about her mother, thank you Michele! “My First Broken Heart. 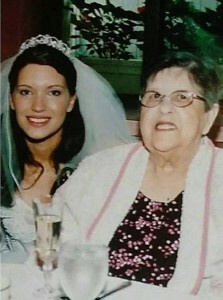 I suffered my first broken heart at the age of 15 and I’ll never forget how my mother helped me get over it. After I had been lying in my mother’s bed crying for a couple of days, my mom came home from work one day with a little pink and white heart shaped pillow about 6″ x 6″. Coming from a family of five children, we didn’t often get spontaneous gifts so it meant a lot to me and I knew it was an effort to help me get through my first broken heart. The pillow itself was nothing special but for some reason I kept it in my cedar chest for years. When I’d see it, It would remind me of my first love and my first broken heart. Click on this button below to listen to an excerpt from our interview with Auntie Phyllis in 2011.